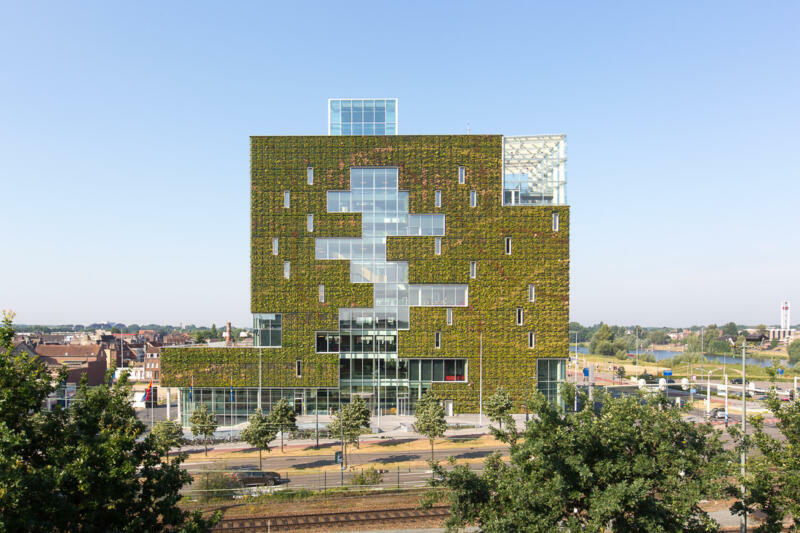 The city of Venlo opened their new city hall in 2016, designed according the cradle-to-cradle principles. The iconic building has been visited by over 25,000 people ever since. The result is a healthy working environment, combined with sustainable innovation. Raw materials and parts used have a ‘passport’, detailing their production and origin. The building is therefore in essence a huge raw-materials databank. When a service or product reaches the end of its useful life, these materials can easily be retrieved for high-grade reuse. The Venlo city office generates its own energy. Through using thermal-energy-storage, solar panels, solar boilers and other energy efficient measures, the structure is energy self-sufficient. Moreover, rainwater is purified to reduce the consumption of clean drinking water. 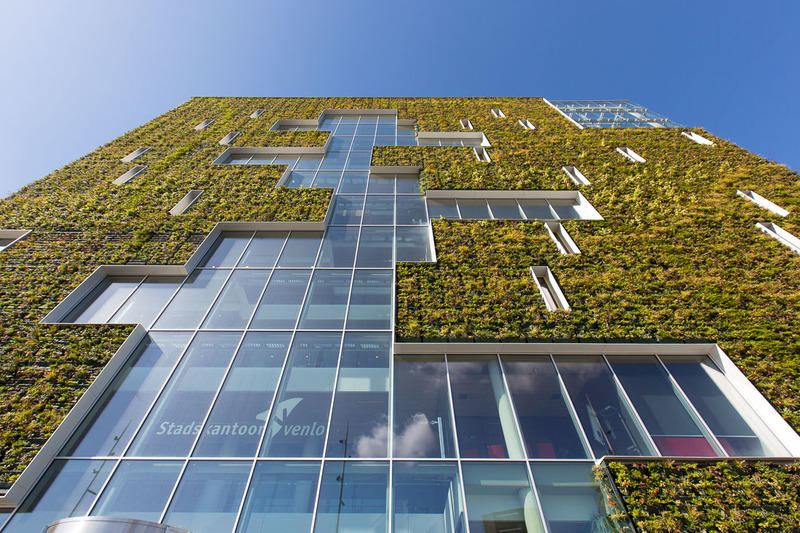 The building’s green façade purifies the air outside and a greenhouse on the roof provides natural ventilation. By doing so, the indoor climate is even better than outside. The interior of the office has ‘green’ walls that regulate humidity, oxygen levels and acoustics. The Municipality of Venlo generates social value by offering its employees a pleasant, bright and natural work environment. By lowering absenteeism due to illness by just 1%, the municipality saves 480,000 euro per year – not even taking into account het increase of productivity due to the pleasant work environment. During the tender phase, the municipality of Venlo selected a design vision instead of a detailed plan. On the one hand to prevent market parties from having to spend a lot of time and resources to complete the tender registration, but especially because the client (in this case Venlo) was not involved in the first phase. This method led to the creation of a team of people who were in the right (circular) mindset. The group also had the willingness to make the cradle- to-cradle (C2C) and circular ambitions of Venlo a reality. Collaboration was key. Several sessions took place to achieve clear understanding of the C2C starting points. The architect and other parties – project management, technical consultants and C2C advisor – were essential to achieve the desired result. 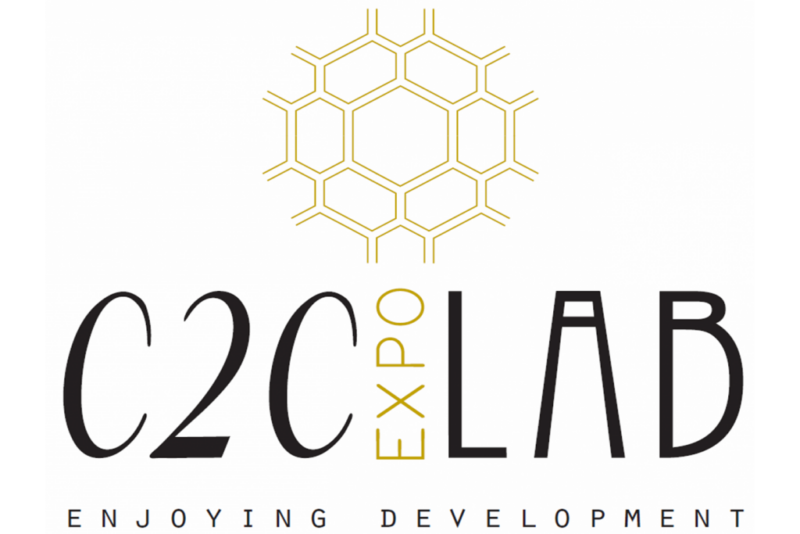 The C2C ExpoLAB supported the municipality of Venlo during the entire process, from the Schedule of Requirements, to design, tender and realisation. The organisation is also involved in various projects at home and abroad.